⇒ Length-scale analysis – on a profile or on a surface (lines or columns). Calculates relative-area in function of scale. ⇒ Area-scale analysis – on a surface (one corner or four corners). Calculates relative-area in function of scale. ⇒ Log-log graph of relative length/area or complexity in function of scale – Possibility to define the analysis domain and the regression domain for the calculation of fractal dimensions. ⇒ Provides regression coefficient R² for functional correlation analyses. 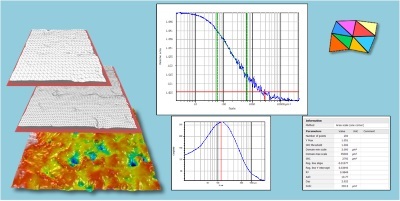 Calculates Smooth-Rough crossover and other parameters formerly included in Sfrax software. ⇒ Includes Dental microwear texture analysis – formerly included in Toothfrax software, with parameters HAsfc (heterogeneity of complexity) and epLsar (exact proportion of length-scale analysis). ⇒ Exports tiles in STL at a given scale. Export graph image. Export graph data in CSV and XLS. ⇒ Includes the Statistics module for statistical correlation and discrimination. ⇒ Benefits from the MountainsMap® infrastructure – 64-bit application, file format compatibility, template-documents, profile/surface preparation and filtration.